Boeing B-52D-65-BO Stratofortress 55-0110, weapons loading. From Dec. 18 to Dec. 29, 1972, Andersen launched 729 sorties against 34 targets in North Vietnam as part of Operation Linebacker II. 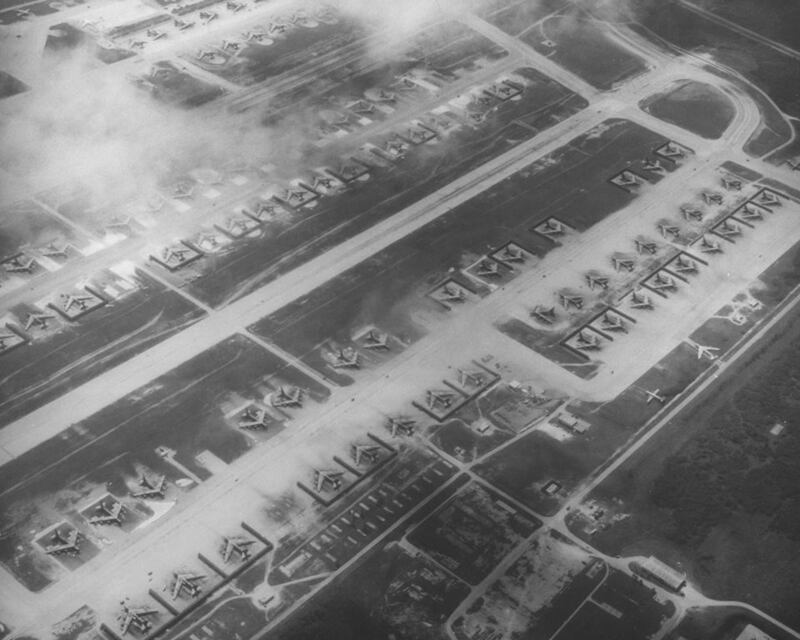 Andersen became the home to over 15,000 Airmen, 153 B-52 bombers and 20 support aircraft during the highest peak of the Vietnam War. The bombing campaign was a success because, in its wake, the North Vietnamese released 591 American prisoners of war and returned to the negotiation table, where the Paris Peace Accords were signed less than a month after the operation. The mission to bring “peace through strength” was never more prevailing than during Operation Linebacker II. 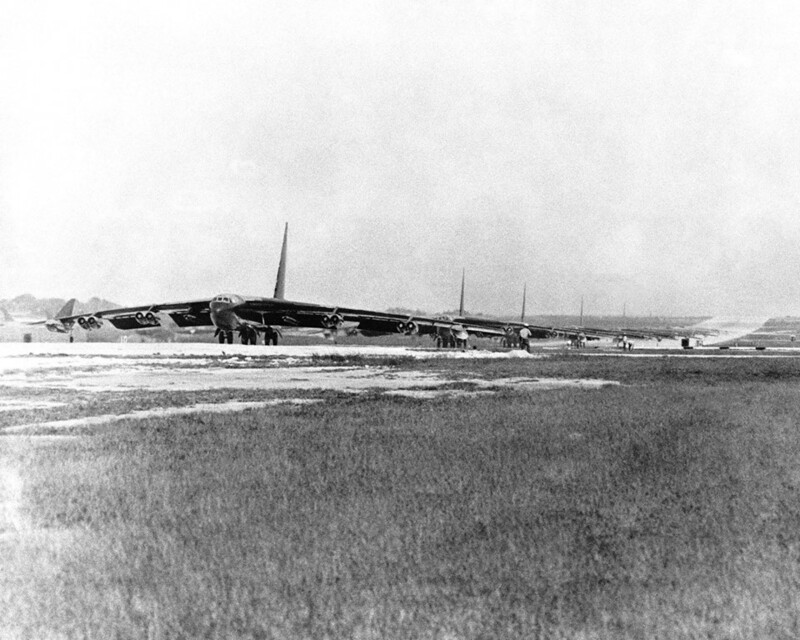 B-52s at Andersen Air Base, Guam, during preparations for Operation Linebacker II in Dec. 1972. 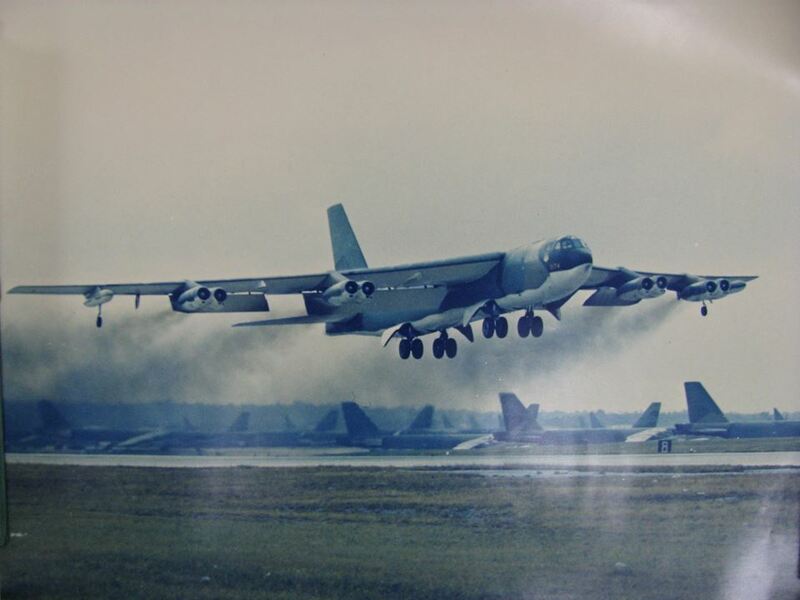 We report the following article titled B-52 played major role in Operation Linebacker II written by Yancy Mailes, Command Historican, Air Force Global Strike Command, to honor 15 aircraft and 33 men did not return. In early 1972, American intelligence agencies provided President Richard Nixon and his staff irrefutable evidence that north Vietnam planned a large-scale offensive to attack south Vietnam. In doing so, north Vietnam planned to capture as much of south Vietnam as possible, with hopes of destroying the Army of the Republic of Vietnam and at the same time undermining South Vietnam’s fragile government. 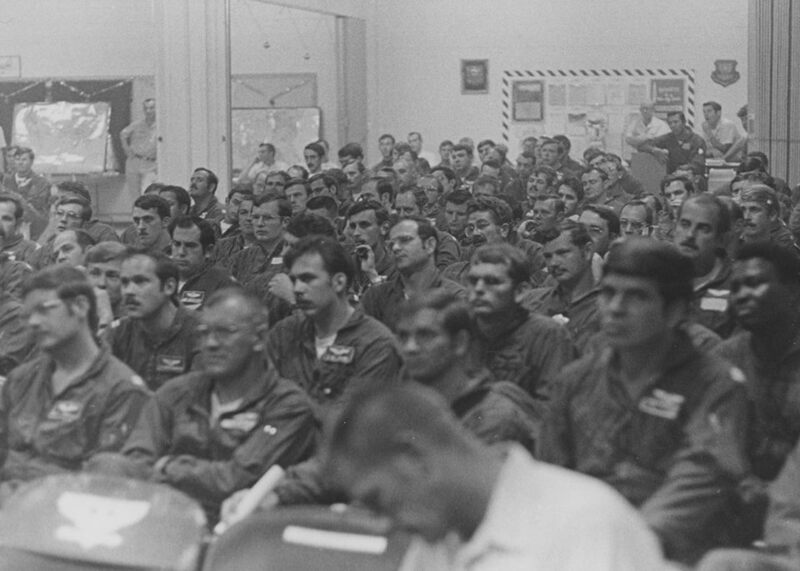 B-52s crews are briefed prior to departing Andersen Air Base, Guam, for missions in Operation Linebacker II in Dec. 1972. The North knew because of Nixon’s Vietnamization policy that the United States had slowly withdrawn its forces and at the time only had 65,000 troops physically in the south. In response, the Nixon administration planned to call upon the B-52 crews to resume air strikes forcing the North to negotiate a peace settlement. 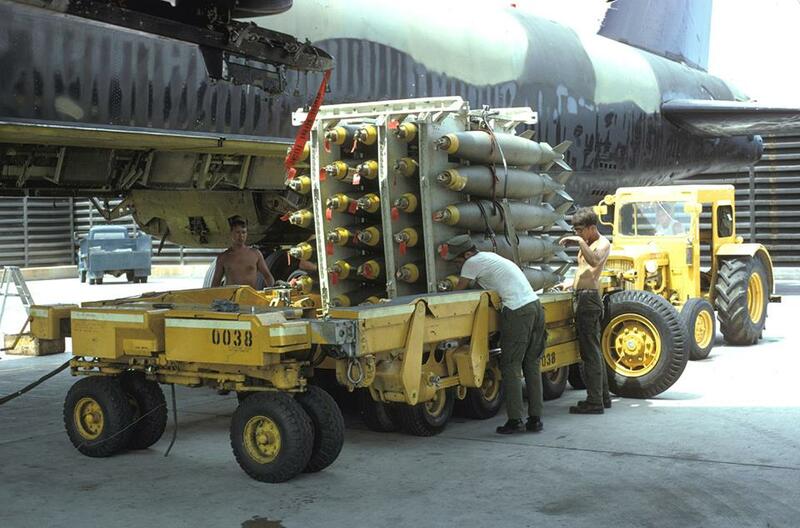 B-52 being loaded with bombs. 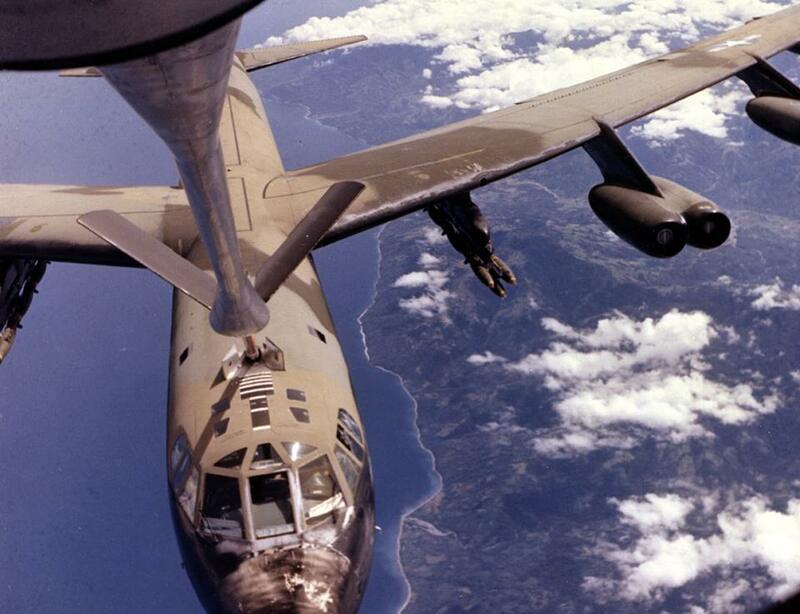 In early February 1972, a rapid build-up of B-52 forces began under Operation Bullet Shot. 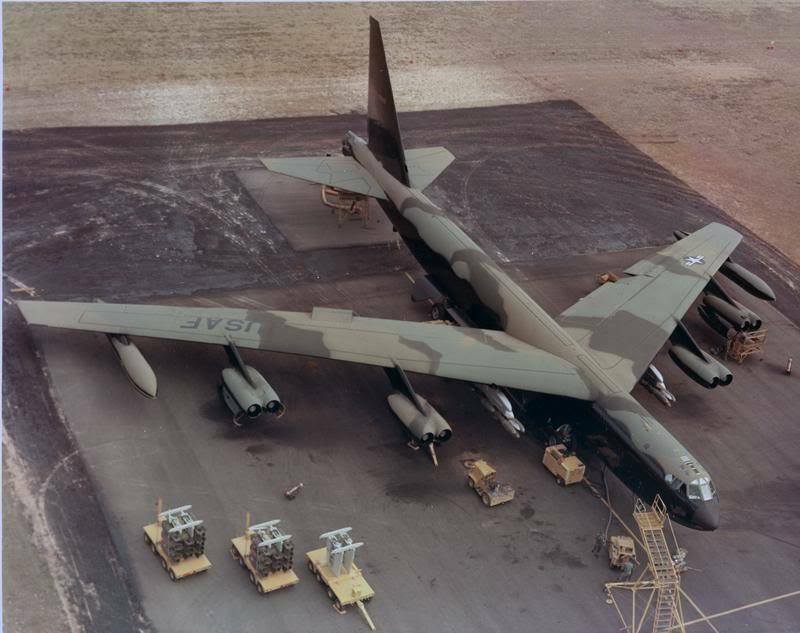 Since September of 1970, the Arc Light sortie rate at Guam and Kadena had dwindled and by the end of 1971 only about forty B-52Ds remained in theater, all based at U-Tapao, Thailand. In order to support the pending operations, Strategic Air Command (SAC) planned to deploy 200 B-52s to the region. Pilot’s view of a typical, three-ship B-52 formation known as a cell. Over the course of the five stages of Bullet Shot, SAC rebuilt Guam’s B-52 force beginning that February with crews from the 7th, 96th and 306th Bomb Wings. With nearly 50 B-52Ds assigned to the 43d Strategic Wing at Guam and an eventual compliment of 54 Ds at U-Tapao, SAC still needed almost 100 bombers to meet the requirement. 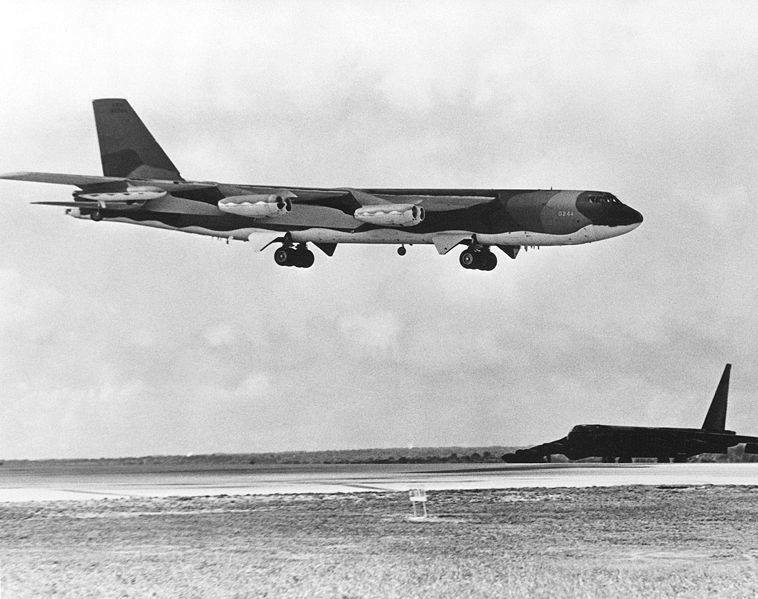 So, later in July 1972 as the build-up continued, the Air Force activated the 72d Bomb Wing Provisional and deployed a compliment of B-52Gs to Guam. 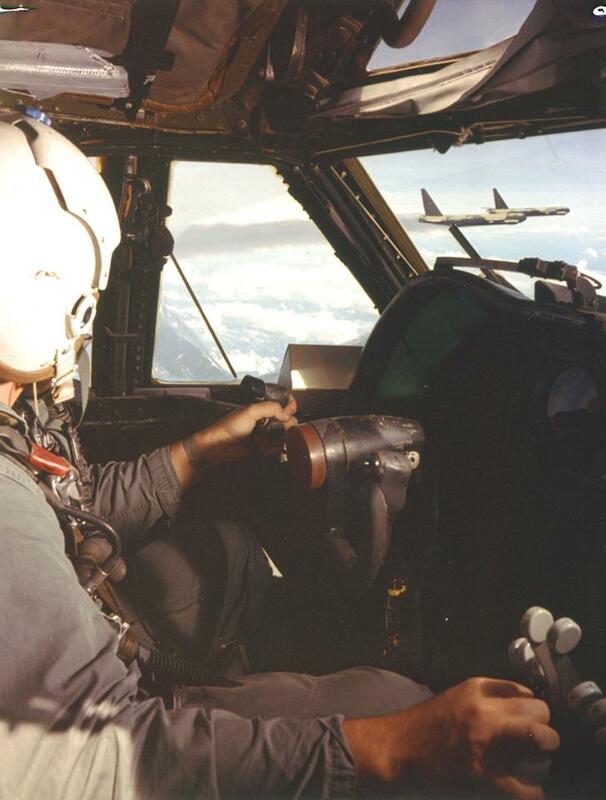 To support this effort, the 2d Bomb Wing alone deployed nearly 1,500 people and 23 bombers in April of 1972. B-52Ds from the Strategic Air Command line up for takeoff as they prepare for strikes over Hanoi and Haiphong, North Vietnam, during Operation Linebacker. On Feb. 14, 1972, the Air Force resumed the Arc Light missions supporting forces inside the borders of south Vietnam with sortie rates rising to 1,500 per month. As the B-52s deployed to Guam and U-Tapao in preparation for strikes north of the Demilitarized Zone, Nixon baulked at launching an all-out bombing campaign against north Vietnam. He had pinned his hopes on the peace negotiations taking place in Paris. Those negotiations failed and on March 30, 1972, under the cover of darkness, north Vietnamese forces launched the Easter Offensive. A short time later, on April 5, the Nixon administration authorized strikes north of the DMZ and Operation Freedom Train got underway. The B-52 operation began with heavy strategic bombing, which many military leaders had continually recommended since 1965. Many senior USAF officers believed in strategic bombing as a means to bring the enemy to the negotiating table, a belief clearly rooted in the history of World War II. B-52 attacks caused tremendous and terrifying destruction. However, the possibility of losing a B-52 to an enemy surface-to-air missile (SAM) loomed in the forefront of each and every B-52 crew going north. While the occasional SA-2 had been launched at B-52 crews operating over the Ho Chi Mihn Trail in 1967, none had come within range. 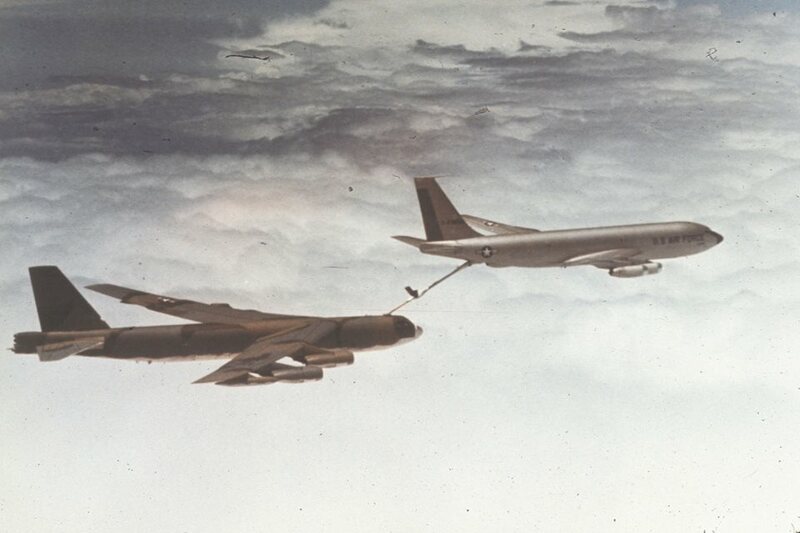 Even long-range bombers like the B-52 needed refueling to reach their targets and return to base on far-off Guam. Bombing operations such as Arc Light and Linebacker depended heavily on air refueling. 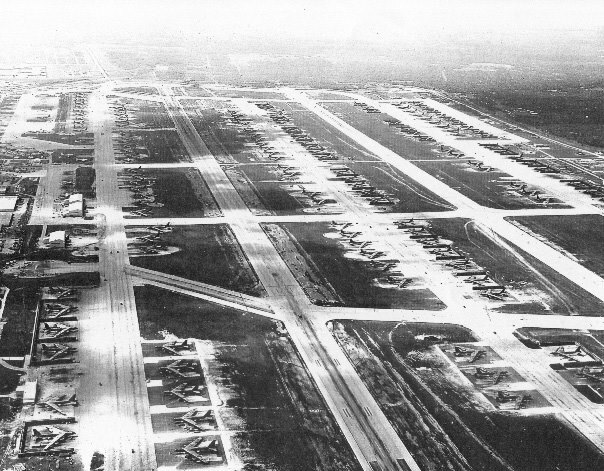 On April 9, 12 B-52D crews took off from U-Tapao and bombed facilities at Vihn. During this mission, an enemy SAM smacked into one of the B-52s, blowing off most of an external wing tank. Even with damage, the crew was able to the fly the wounded bomber south and land at Da Nang air base. 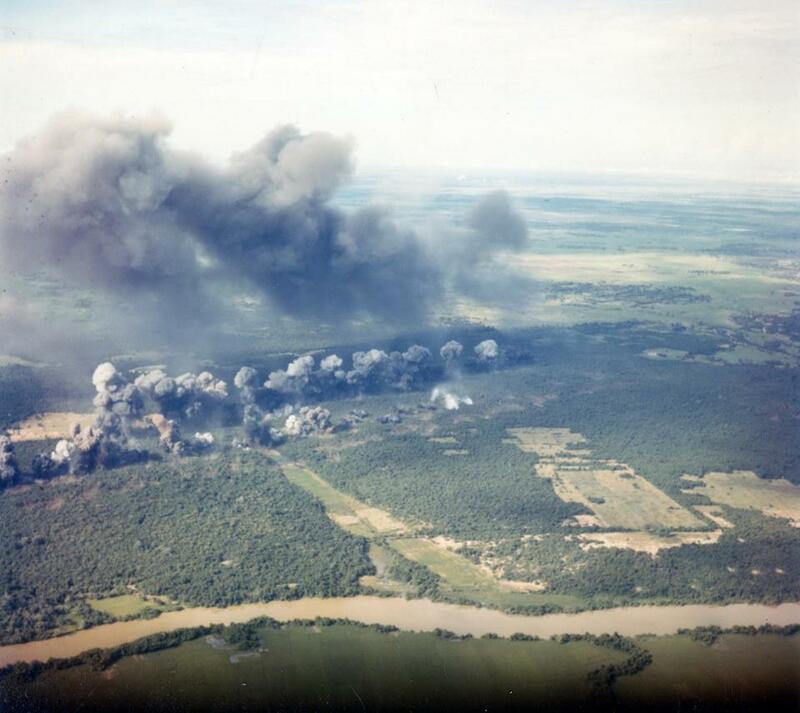 Several days later, after striking a rail yard and a POL store near Hanoi, bomb crews tested the main ring of SAM sites around that city as well as the defenses near Haiphong Harbor. The enemy launched 35 missiles, all of which failed to inflict damage. However, it became clear that the B-52 was in danger of being hunted by the enemy. Aerial refueling made bombing missions from Guam possible. Operation Freedom Train continued until May 8, when the Air Force re-named the operation as Linebacker. 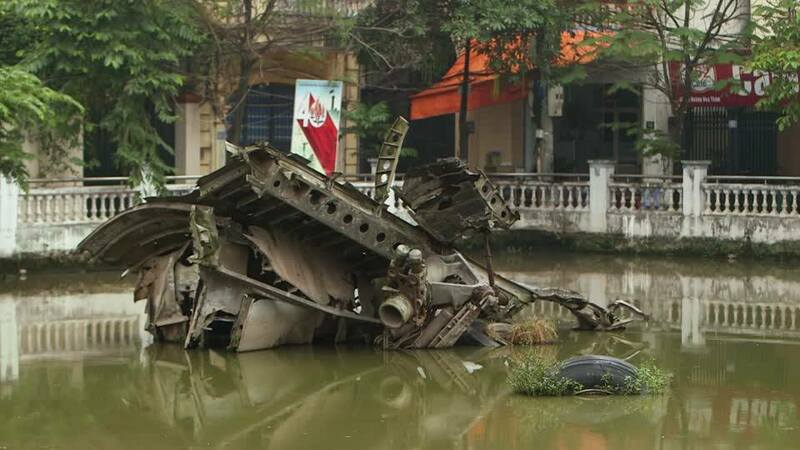 The Air Force stated that Linebacker had been put into action to disrupt the huge rail network whereby north Vietnam received supplies and weapons from China. The United States decided it would be better to interdict those supplies before they reached north Vietnam and disappeared on the Ho Chi Mihn Trail. The operation continued until Oct. 23, 1972. At that point it appeared that the bombing campaign had brought the north back the negotiating table, so President Nixon halted all air operations above the 20th parallel. However, Arc Light missions in south Vietnam continued. 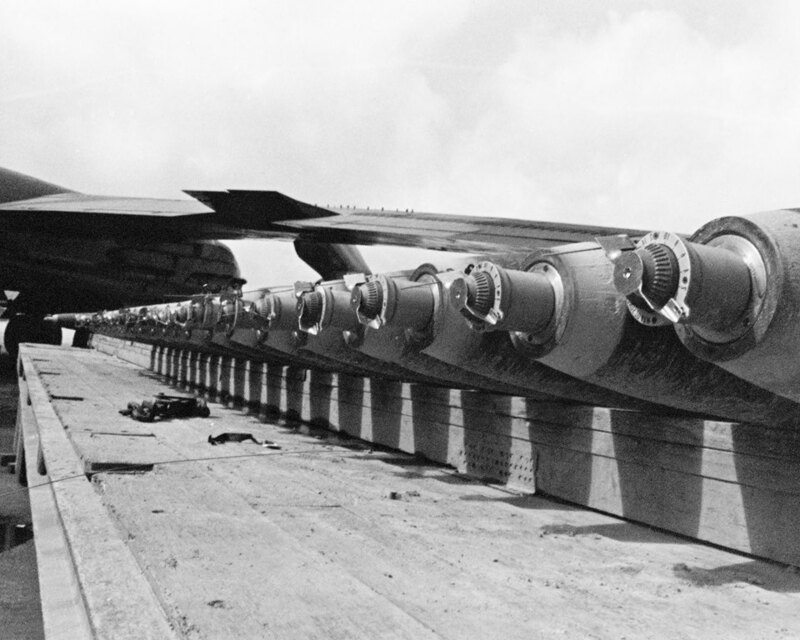 With their shipping plugs replaced by fuses, these bombs are ready to load onto a B-52 at Andersen AFB, Guam, for Operation Linebacker II. 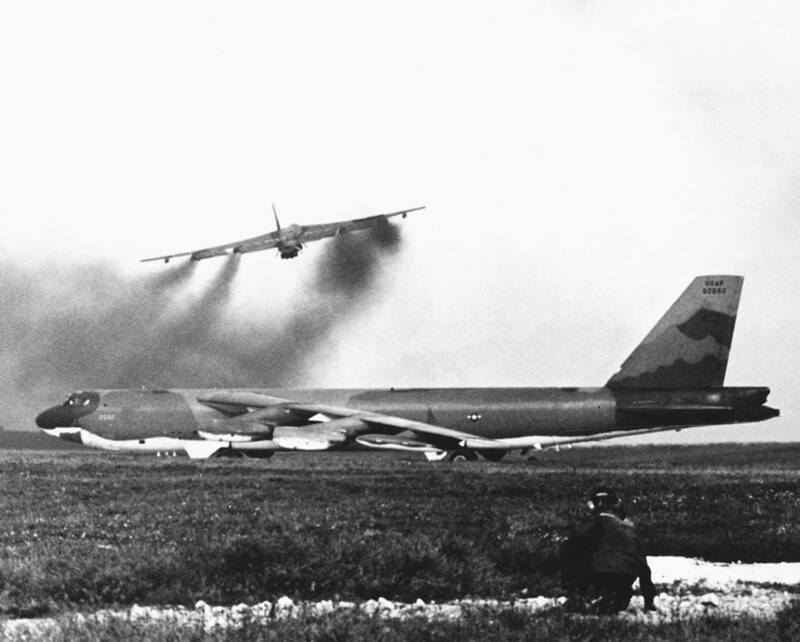 During Operations Freedom Train and Linebacker the B-52 community played a major role in bringing north Vietnam back the negotiating table. But unfortunately because SAC had been lucky and the enemy failed to down a B-52, SAC planners continued to employ tactics developed early in the war. A typical mission consisted of a three-ship color-coded cell that was imbedded in a wave. During Linebacker, SAC would launch around twenty-two cells per day. 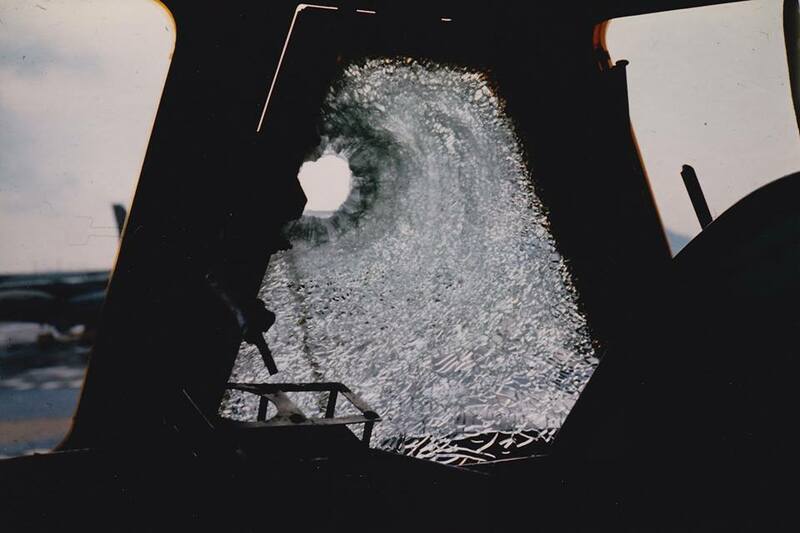 A pilot’s window damaged by a fragment from an SA-2. During these missions, a trail of bombers that included two or three waves, separated by an hour or more, would consistently drop bombs from an altitude of 30 to 35,000 feet. In addition, the formation would maintain a constant airspeed of about 430kt over poorly defended targets and 470kt over SAM-infested areas. In most cases, the cells used the same altitudes, headings and departure routes. This consistency allowed the enemy to quickly learn the B-52 community’s tactics and launch large salvos of SAMs. 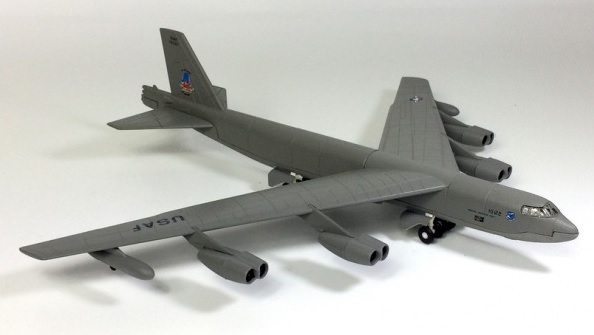 Luckily, they failed to hit a B-52 during Operations Freedom Train and Linebacker, but this flaw would be devastating to the follow-on campaign, Operation Linebacker II. 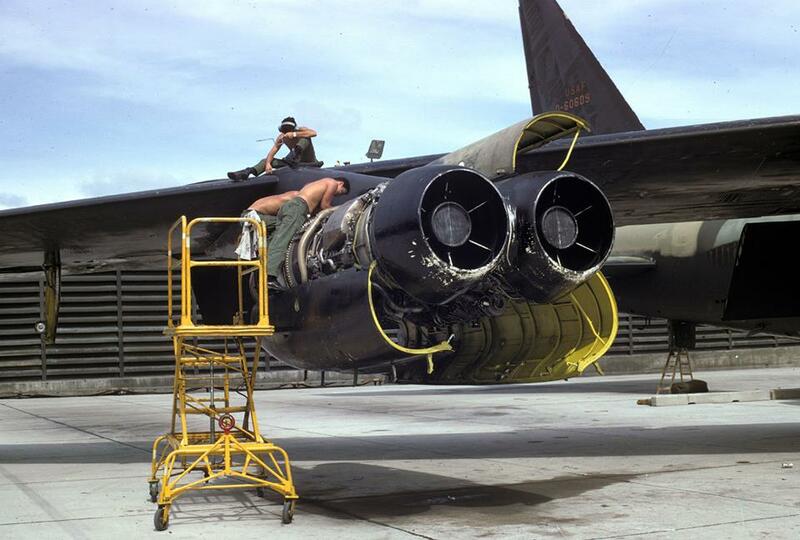 USAF maintainers worked day and night to keep LINEBACKER II going. It was during the bombing pause, which Nixon ordered to give the North time to negotiate, that the enemy finally downed a B-52. On Nov. 22, 1972, the crew of Olive 2, one of eighteen B-52Ds assigned to the 307th Strategic Wing at U-Tapao, Thailand, took part in a bombing raid against targets in and around Vihn. A U.S. Air Force Boeing B-52G-125-BW Stratofortress (s/n 59-2582) from the 72nd Strategic Wing (Provisional) waits beside the runway at Andersen Air Force Base, Guam (USA), as another B-52 takes off for a bombing mission over North Vietnam during Operation Linebacker II on 18 December 1972. Just after the crew dropped their bomb load, two SAMs streaked up from the ground and exploded beneath the airplane. A U.S. Air Force Boeing B-52D Stratofortress from the 43rd Strategic Wing waits beside the runway at Andersen Air Force Base, Guam (USA), as a B-52G-110-BW (s/n 58-0244) from the 72nd Strategic Wing (Provisional) approaches for landing after completing a bombing mission over North Vietnam during Operation Linebacker II on 15 December 1972. The crew of the damaged B-52 nursed their bomber for over 100 miles until they crossed the Mekong River and were over Thailand. Once there, the crew bailed out of the airplane and a combat rescue crew quickly snatched the six men from the jungle. Up until this point only 10 B-52s had been lost during combat, but this was the first to be destroyed by hostile fire.